There are many models for understanding and characterizing the styles of interaction different people prefer to employ. 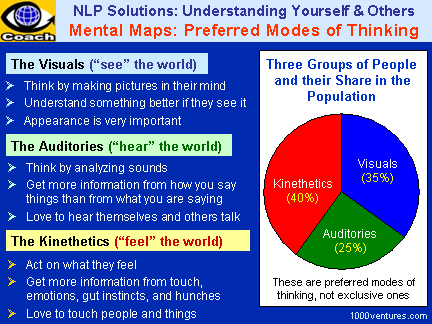 Different people take in the world through different senses – seeing, hearing, or feeling it. Further, different people tend to lead their decision-making process with one of the four functions: → thinking , feeling, intuition, and sensing. Vividly → differentiated differences that are anchored to a product and engage the above functions can enhance memory of your current and prospective customers. E-sales of the Business Guru for trainers rose by 30% within a week after the description of the product at the buy-now page was changed from "training course" to "training course with 200 slides". Apart from communicating the simplicity and easy delivery of the material, the word "slides" established quick connection with the visuals reading the description. Different people pay attention to different things and apply different criteria for making decisions. When people → solve problems , the four functions - feeling, sensing, thinking, and intuition – come into play in different combinations. The Myers-Briggs Type Indicator (MBTI) is a widely used approach for understanding and characterizing the styles of interaction different people prefer to employ. It is based, in particular, on the following dimensions of a person's preferred approach to → life. Let's look at these functions from a → selling point of view. "The ultimate driving machine", by BMW, especially when they present facts like ergonomic design, maneuvrability, and a lots of expert reviews on how BMW's drive.